Wooden base for your Small Monster Mill. This is our standard medium density fiber board base all by itself. NOT water resistant. Approximately 12"x12"x3/4" and big enough to sit on any 5 gallon bucket. 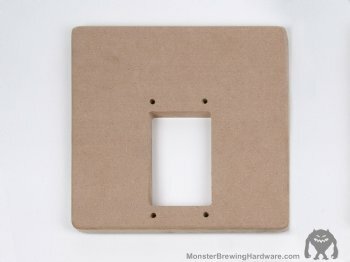 Has a window cutout, and mounting holes at 2 7/8 x 6 9/16 centers to mount your small monster mill. Fits all 3.5" wide monster mills (MM-2 and MM-3). This base is precision CNC router cut to fit your Monster Mill. We recommend that you mount the mill with the drive shaft over the CENTER of the base for best balance and performance when drill driving your mill.